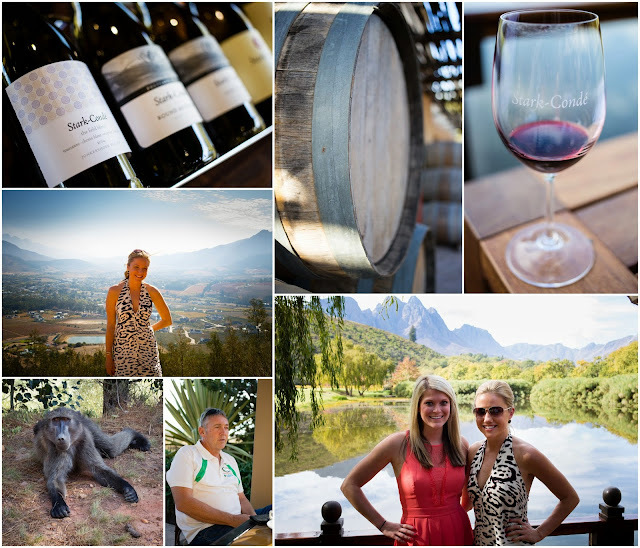 Since the idea for our South Africa trip was hatched over a glass (ok, bottle) of wine, it's only fitting that we drank plenty of it during our 8-day stay. Many people recommended for us to spend a night or two in the winelands if possible. However, since our time was limited and we had so many things on our "list," we opted instead for a one-day wine tour originating from Cape Town. My research led me to Luhambo Tours, due to... you guessed it... their great Trip Advisor reviews. 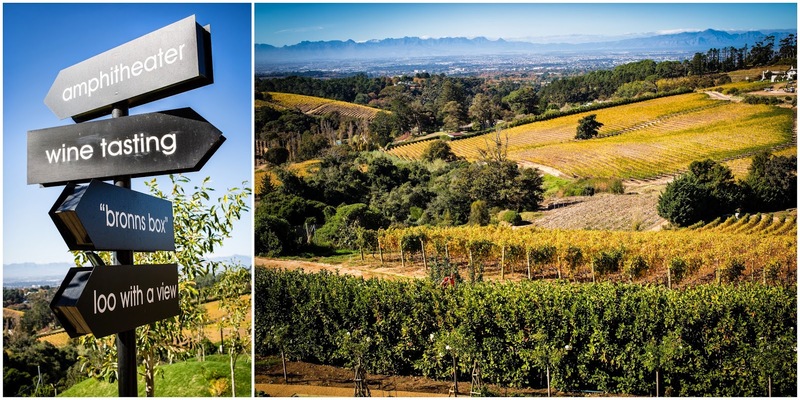 Similar to the shark dive, they offer Cape Town pick-ups and a full day in wine country, visiting 4 wineries with a stop for lunch (at additional cost). Graham was our guide for the day, and was not only knowledgeable about wine, but also South African history. In addition to the wine tastings, he took us to a beautiful vista point, indulged us when we wanted to take photos of baboons on the side of the road, and even took us by the prison where Nelson Mandela made his long walk to freedom. If you end up purchasing wine at any of the wine farms, you will find it extremely affordable. I think the most expensive bottle we encountered was around $30... with most averaging around $10. (The tour will range from about $70-$80 depending on the amount of people on the trip). Since our tour group for this day was quite small (four people total), Luhambo was able to grant my request to dine at Bread and Wine for lunch instead one of their normal stops. It is the sister restaurant of the acclaimed Tasting Room at Le Quartier Francais, and it was fabulous. (The couple with us on the tour declared it their best meal of their trip!) Dana and I tried Springbok for the first time (similar to antelope and this one wrapped in bacon....mmmm), and we also enjoyed the risotto served in a bowl that was literally "painted" with beet juice. And, as you might imagine, the bread and the wine were outstanding here as well. 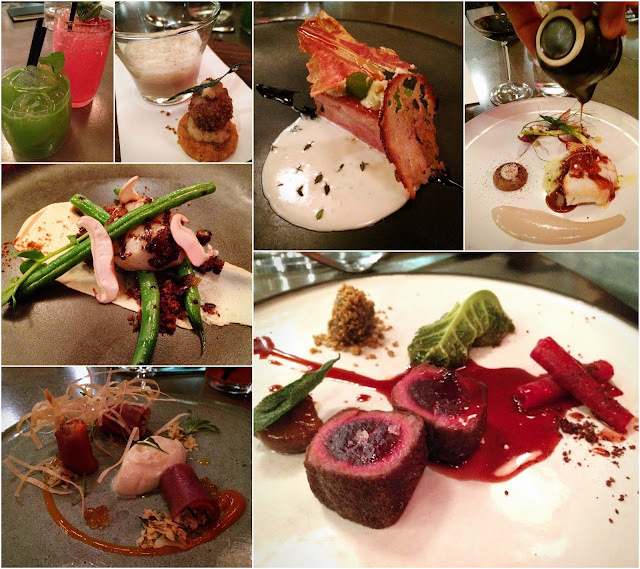 Cape Town is home to not only one of the top 50 restaurants in the world, but also the best one in all of Africa. For that reason, I should have known that The Test Kitchen would be booked up months in advance, but I asked to be put on the wait list just in case. Just like pretty much everything on this trip, luck was on our side. As we were actually sitting at Bread and Wine for lunch, The Test Kitchen called to inform us they had an opening for that very evening. We of course jumped at the chance. I would venture to say this might be the cheapest restaurant on that world's top 50 list. We opted for the "Discovery," which was a 5-course tasting menu (so we tried 10 different dishes in all), ordered a cocktail each and a bottle of wine to share, and our total (with tip) came out to about $99 per person. While that is very expensive by South Africa standards, a comparable meal of that caliber in the U.S. and other places would run you $300 or $400. Some of our favorites of the meal included more springbok (this time seared) with chestnuts and liver, pork belly with crackling, scallop with shitake mushrooms and kingklip (a type of white fish) served with a roasted potato skin puree and burnt red onion foam. We also loved the amuse bousche of artichoke soup and the generous cheese plate offered as one of the dessert options. Every dish and every bite was as beautiful as it was delicious. Note: if you can't get into Test Kitchen, they do have a sister restaurant, Pot Luck Club, which is more casual and meant to be just as good. (That was my backup if we hadn't gotten into Test Kitchen). The closest of the wine regions to Cape Town is Constantia, which is on the other side of Table Mountain and about a 20 minute drive (or a $15 Uber ride). The wine wasn't *quite* as good as Stellenbosch or Franschoek, but it was equally as gorgeous and a great option if you don't have a full day to spare in the winelands. If you go, you must visit Beau Constantia. It's more wine bar than winery, but they still offer flights of wine tastings at a very affordable price, along with small bites (there's also a restaurant downstairs). The best part is the view... from both the tasting room and the bathroom! (Hence, the "loo with a view" sign). I used the bathroom twice just for the novelty of it all. We also visited Buitenverwachting (say that five times fast), which is one of the oldest wineries in South Africa and the backdrop for the movie Blood Diamond. They also have a highly rated restaurant on the grounds. Just up the road from Beau Constantia (a very steep road that most people would drive, but we decided to walk) is La Columbe, which is probably considered the second best restaurant in Cape Town. (In fact, chef Luke Dale-Roberts worked here before he opened Test Kitchen). As a bonus, they are open for lunch, which was perfect as it allowed us to order a couple of items al a carte after our wine tasting in Constantia. The amuse bousche was an adorable "can" of tuna... which was actually tuna tartare. We tried ostrich for the first time, which came prepared two ways: both seared and as a tataki. 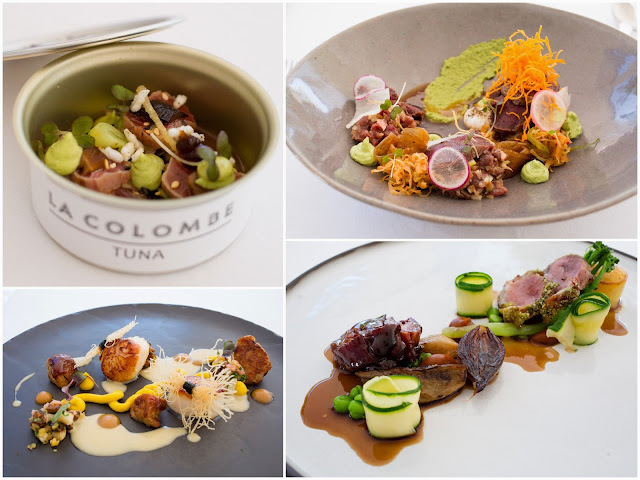 We also ordered scallops served with veal sweetbreads, and Karoo lamb... again served two ways and again absolutely stunning in both taste and preparation. While we were treated to some world-class cuisine at the restaurants mentioned above, perhaps my favorite meal of the trip was the braai we enjoyed at the home of Riaan and Yvette (introduced by my co-worker Cary Chow). "Braai" is Afrikaans for "barbeque" or "grill." It's a wonderful social custom in South Africa that is enjoyed with friends and family. Riaan invited some friends over (including Leith & Rinnet), and they treated us to an impressive feast. The food is all cooked over hot coals obtained from the fire on a large circular stone, with seating all around. We had "braai pie," which was basically a puff pastry filled with cheese and caramelized onions. We also had "oopsies" which were bacon wrapped sausages on a stick. They grilled grabouw and lamb sausages and rosemary pork chops. Rinnet made "pap and sous," which had the consistency of cous cous but made from corn mielie and topped with a chunky tomato sauce. We washed it all down with wine and dessert and experienced "magies vol ogies toe"... which basically means "full belly followed by sleep" in Afrikaans. 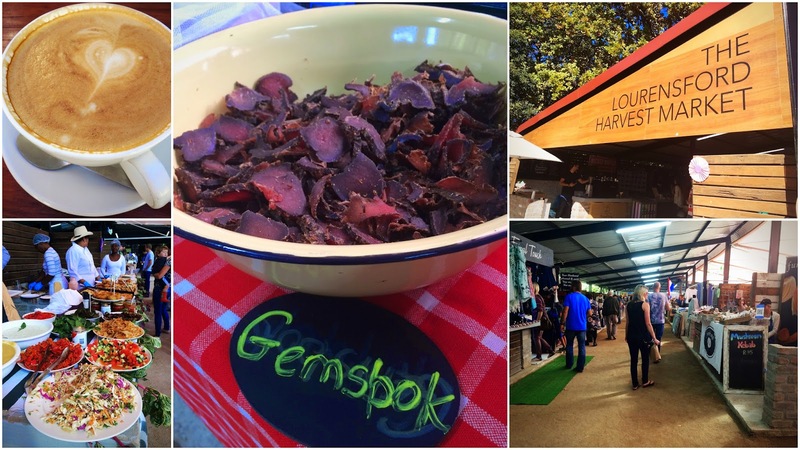 The next morning, we also visited the Lourensford Harvest Market, a lovely little foodie market near their home in Somerset West. It was here I tried "biltong" for the first time, which is South Africa's version of jerky. The difference is it is dried and then sliced (versus jerky, which is sliced and then dried). This particular one was "gemsbok"... another type of antelope, but it also comes in beef. I'm officially obsessed! We also visited a local coffee roaster and purchased coffee beans to bring home. In addition to everything listed above, we also had some wonderful seafood on the V&A Waterfront at Baia, and sampled traditional Cape Malay cuisine (similar to Indian food) at Bo-Kaap Kombuis on Signal Hill overlooking Table Mountian (we were there when it was dark, but would be a great view to watch the sunset). We loved the huge sushi rolls at Takumi, and also enjoyed some lunch in Camp's Bay looking out at the water one afternoon before visiting Clifton Beach. Throughout all of our adventures, we left Cape Town with full bellies and hearts, and a desire to come back as soon as possible. Click here to read about more Cape Town activities and click here to read about our safari in Sabi Sands! Hey Jaymee! Just came across your stuff and enjoy reading about your travels. Would love to connect with you sometime! great blog. us africans can get so bogged down by the many huge problems facing this continent, that we forget the incredible beauty, rich cultures and amazing lifestyles many of us have.